Drug development for mood disorders such as major depressive disorder (MDD) and bipolar disorder (BPD) has undergone an important paradigm shift in the last decade due to our expanding knowledge of the pathophysiology and treatment of these illnesses. While previous research focused exclusively on abnormalities of the monoaminergic neurotransmitter systems, more recent preclinical and clinical studies have emphasized the role of impaired neuroplasticity and cellular resilience in mood disorders. 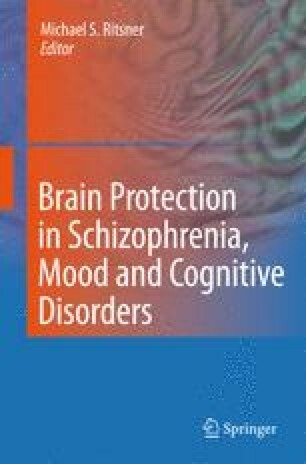 Also informing our thinking for drug development are the neurotrophic/neuroprotective properties associated with several agents currently used as treatments for mood disorders—including antidepressants, mood stabilizers, atypical antipsychotics, and a number of experimental agents currently under investigation. Many of these agents share some potent neurotrophic and neuroprotective properties, exert significant effects on signaling pathways that regulate cellular plasticity, and are believed to act directly on some of the core pathophysiological mechanisms underlying these devastating illnesses. In this chapter, we discuss how drugs that modulate signaling pathways involved in regulating cell survival and cell death target some of the core pathophysiological mechanisms of BPD and MDD, with a particular emphasis on brain imaging and neuropathological abnormalities in mood disorders. Cellular and molecular mechanisms of action of agents with neurotrophic and neuroplastic properties are also discussed, with a special focus on the mood stabilizers lithium and valproate. The authors gratefully acknowledge the support of the Intramural Research Program of the National Institute of Mental Health. Ioline Henter provided outstanding editorial assistance.